Happy Memorial Day, friends! I hope that as you’re reading this, you’re laying out in the sun with a freezepop or a slice (half) of watermelon or something else cold and delicious in your hand remembering those who have served on our behalf. I couldn’t have picked a more fitting outfit for this holiday, and am so excited to be partnering with Nordstrom to share all of the details with you! 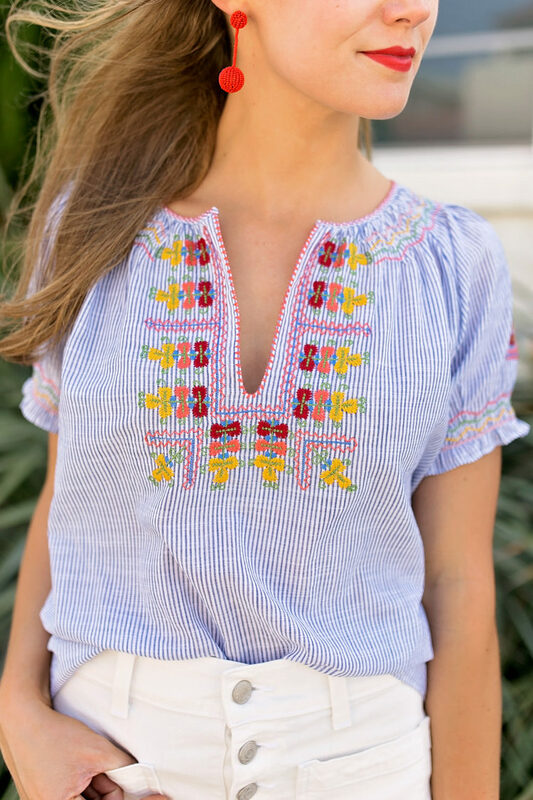 Can we take a second to soak in the beauty that is this colorful embroidered blouse?! I walked past it last week and quite literally did a double take. I’m a sucker for embroidery, and wish I could explain how vibrant, delicate and beautiful the stitching is on this top. 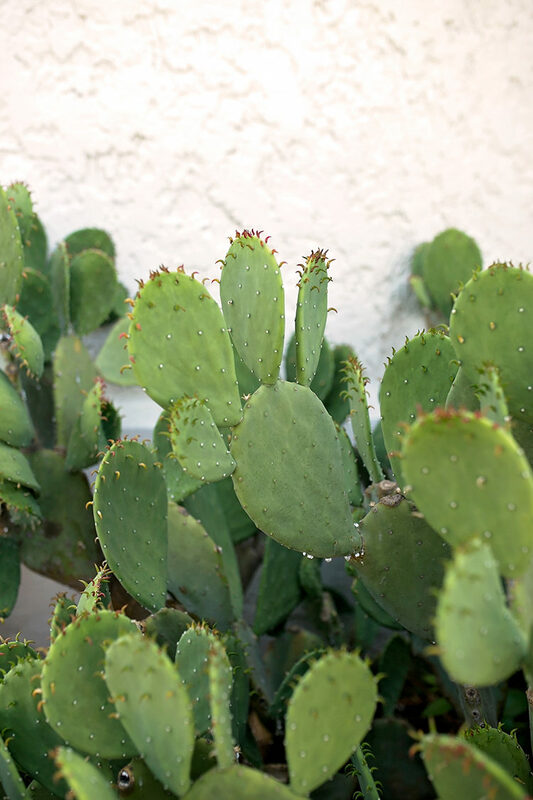 If you take a second to look at the close-up photo above, you’ll see just how detailed it is! I’ll be the first to admit that out of all the different items of clothing, blouses are the ones I spend the least amount of money on. Beautiful dresses or staple pairs of shoes tend to get the biggest cut of the clothing budget, probably because it’s so easy to find low-priced, on-trend tops just about anywhere these days. Even though this blouse was a bit more than my typical $20 purchase, I hvae to tell you that it’s been my best buy of the season. That’s because I find myself wearing it all the time, as it’s perfect for so many occasions! 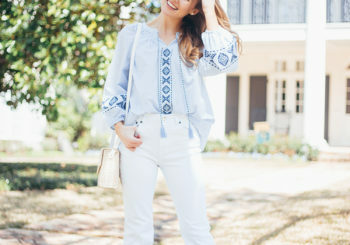 I wore it last week with the white shorts I have on above for a day of errands, and switched into white jeans and wedges for dinner with a friend. It’s perfect for church, brunch, trips to the lakehosue (so darling with jean cutoffs!) and summer vacations! The perfect lightweight summer top you’ll have in your closet for years, and not just months. That’s when you know you’re making a good purchase! P.S. Did you catch my newest video announcing a spontaneous trip the cowboy and I planned?! Well friends… we’ve added Italy to the itenerary! And I am now absolutely beside myself with excitement. I’ll be working all of today in preparation for our Wednesday departure, but can’t complain with that on the horizon! Such a cute top. I love it!